On October 21st CODEPINK launched a #DivestFromWar campaign in Washington D.C. at the Divest from the War Machine Summit. CODEPINK, a women-led grassroots organization started 15 years ago, works to end U.S. wars and militarism as well as support peace and human rights initiatives. CODEPINK aims to redirect U.S. tax dollars from the war economy and into the peace economy- healthcare, education, green jobs and focusing on quality of human life. The summit began with CODEPINK founders Medea Benjamin and Jodie Evans taking the floor. Benjamin spoke about the hidden war taking place in Yemen which is currently the largest humanitarian crisis in the world, and how U.S. weapons industry along with the other “great democracies of the world” a direct link to the deaths taking place. She also spoke about how the same weapons that are being shipped abroad are also being used in our own American streets: the same teargas canisters that police throw at protesters are also used by Israeli forces to throw at Palestinians on the Westbank trying to reclaim their rights. “I’m sick and tired of having our companies inflicting so much suffering on people of the world and making a profit off of it,” Benjamin stated simply. Jodie Evans spoke about how war has become normalized to millennials- an entire generation that has only known war. She commented that under Obama the anti-war movement was a silenced movement, but is becoming alive again during trump, with 65% of tax dollars going to war and the military. Evans was excited about the divest campaign because the anti-war movement had not yet had such a long term plan for ending war. Her question for the audience was, how do we make the movement relational? The Divest from War campaign organizer, Haley Pedersen, took the floor explaining that 23 cents of every tax dollar goes into military contractors’ pockets, with top producer Lockheed Martin’s CEO making $19 million in 2016. During this same year 150,000 people died in violent conflicts around the world as a direct result of these weapons with 90% of those killed in wars being mostly women and children civilians, and an additional 65 million people displaced because of war. Military contractors make endless profits at the expense of endless suffering with their CEOs routinely making the top paid CEOs list. Pederson said CODEPINK is currently working with different partners in divestment. There are currently 43 million people in poverty in the US whose needs could be met instead of spending money targeting people of color in different countries. She said we must educate ourselves, agitate in our communities, and make pariahs out of military contractors. William Hartung from the Center for International Policy spoke next about the 300,000 billion plus per year that goes straight to military contractors at the same time that Yemen could have 1 million cholera victims by end of year. He spoke about how the weapons contractors are profiting from current policies, but even before trump the U.S. was already engaged in 7 wars with additional special operations in the Philippines and Africa. He stated that solutions would include successful campaigns similar to the BDS movement for Palestinian rights, and to have these campaigns initiated by people on receiving end of these policies centering their voices and the impacts on their communities. Hartung said we must focus on the most egregious cases to gain attention, but also look at cross issues such as police violence, the private prison industry, militarization of the border in addition to overseas wars. Next on the speaker line up was Ajamu Baraka with the Black Alliance for Peace who continued the discussion of cross issues. Baraka ran as vice president on the Green Party ticket for the 2016 presidential election and has roots in black liberation, anti apartheid, and anti militarism, including working to end U.S. intervention in Central America. Baraka explained that the Black community was pretty solidly anti-war until the election of Obama in 2008. He said that now is the time to revive the black community’s traditional response as it relates to war, and broader anti-war movement in this country. “When we talk about the state we understand state to be an instrument for a white supremacist, settler colonial capitalist system based on greed… So we’re clear about that,” Ajamu Baraka stated. Baraka spoke about the fact that both parties, Democrats and Republicans, are bent on upholding the U.S. as a global hegemony with military violence being the leading tool for this. The commitment to national dominance has united neoliberals and liberal interventionists as we all witnessed with the wars in Iraq and Afghanistan. We must work to systematically dismantle oppressive structures or we are complicit in those crimes. Baraka explained that to dismantle the military industrial complex within the U.S. we must recognize three interrelated components: the ideological and cultural role war has played in the evolution of this country, the political and economic implications of war, and the weakened organizational structure of the anti-war movement in the U.S.
Ideological and Cultural: War is a central part U.S. national identity as it is a settler-colonialist state born out of violence and existing through the military conquest of a people. Violence born cultures such as the U.S. have a way of normalizing and legitimizing violence, which is why the gun control conversation is so difficult in America. The U.S. has a cultural bias toward the use of violence and violence is tied to the perception of what it is to be male in the U.S. This gender component is reflected in attitudes, cinema, and games. Through this, it becomes easier to go from an individual level aggression to a collective level of aggression. Additionally, the ruling class create propaganda utilizing the issue of race. For basically all wars, the US unites with Western Europe against countries of people of color while demonizing and “othering” these people of color. We must raise up the issue of race and white supremacy to be morally consistent and truly confront racialized values of life. Political and economic: Both Democrat and Republican parties in the U.S. are committed to the military budget and militarism. Every level of government has an interest in the war economy and the two party monopoly takes opposition to militarism out of mainstream discussion. Organizationally: The U.S. has a weak and fragmented anti-war movement but we are at a point in history to perhaps change this. We must avoid dependency on NGOs, not focus as much on technical and we must lose the politics with the idea of creating an ethical framework becoming the primary means to de-legitimate militarism across party lines. We must raise issues of race and link the anti-war movement to ongoing fights and connect the campaign to a movement to close all US foreign military bases. We talk about the 1033 program which provides military gear to police forces across the U.S. as well as linking guns and gun control. The U.S. is the number one arms trader on planet (direct impact on all of us in this country). People tired of endless war, all they are looking for now is an opportunity to be more involved. Gina Best spoke next- the mother of India Jasmine who was shot and killed by police two years ago. India was in the navy, and was in a car with her baby and partner when she was shot and killed by swat team of four officers. The police threw flash grenades and fired 30 rounds Best’s daughter’s car with military provided weapons. The police narrative after the fact was that India’s boyfriend had fired a shot from the car which seemed like an attempt to demonizing him so as to sanitize the police’s own actions. There was no arrest warrant for India, her partner, or her baby. Miriam Pemberton from the Institute for Policy Studies spoke about divestment as a new tool for weakening the strength of the war economy. However, if the campaign succeeds a lot of people will lose their jobs. So we must move the money by investing in renewable energy instead of oil and gas. Assuming we can avoid a nuclear war the biggest threat to us all is climate change, so the anti-war movement can follow path laid out by fossil fuels divestment campaign. During this change, the anti-war movement could focus on targeting assistance toward employees of military contractors as well as asking for accountability of wasteful military spending through cross partisan campaigns, as this extreme and violent waste has nothing to do with fiscal conservatism. Maggie Martin, a veteran of war and now an anti-war advocate through Drop the MIC (Military Industrial Complex) campaign spoke about collaboration on the ground. Drop the MIC is collaborating with Black Lives Matter, veterans, immigrant rights groups and more. They are not asking “why aren’t people showing up for our anti-war events” but instead asking, how can we build connections, be better allies and show up for these other groups? Martin explained that the Movement for Black Lives has a divestment campaign which lays out a lot of what the anti-war movement is trying to do (taking resources from destructive industries and putting back into community). Martin envisions a just transition out of the military economy by creating new ways for people to engage in the world. Drop the MIC is focusing on what they call the “4 P’s of MIC” (military industrial complex): profit, political influence, public image and privatization of defense industries (leading to out of control profiting). By pulling support away from the police state and replacing with grassroots community defense networks, we can begin to practice in our own country what we want the international community to look like through the anti-war lens. “Through international solidarity we can help to expose the lie that people are our enemies. They don’t want war, we don’t want war, what’s the problem? We can begin with that as a point to work from,” Martin explains. In addition to building a new physical world, we also need to change the way that we talk about the military. We should cease to use the term “defense contractors,” as the anti- war movement posits that war is not a viable defense. We should instead use the term military contractors or Pentagon contractors. We can also redefine the idea of national defense in a new direction like preventing climate change- thus, it wouldn’t just be national defense anymore, but global defense and solidarity. Wilkerson began by speaking about what he calls the new “terrorist industrial complex”: cyber warfare. Regarding widespread torture policies in the U.S. military, the government still just defines those who are caught torturing others as “bad apples” instead of admitting policy implications. Wilkerson said that we have expanded our alliances and increased our reach for commercial purposes, specifically selling weapons. In addition, the U.S. subsidizes its weapons contractors if they don’t have the money. Part of the American empire is selling these weapons to the world. Wilkerson said that current Secretary of State Rex Tillerson only in the position in an attempt to destroy diplomacy because diplomacy is only something for “commie pinko fags.” Wilkerson believes that Tillerson’s mission is to dismantle the state department. Wilkerson stated that oil companies regularly interfere with foreign affairs and overthrow governments, so what is the need for state diplomacy? He said Shell’s think tank is proud of overthrowing a government, and Wilkerson said he wouldn’t give details, but it “had something to do with Idi Amin.” He also said that six months ago he would have said there was no chance we would invade Venezuela for oil, but now he says he believes in a 30% chance. Wilkerson said he believes trump is heavily in debt to Russian oligarchs. He said lots of people live luxuriously like that- just trading debt around. In conclusion, Wilkerson stated that he believes the best way to use the military is to “cut them to the bone and make them work more efficiently. And maybe they will change their strategy as well”. Nuclear weapons were recently made illegal by international treaties. One nuclear arms submarine is equivalent to two WWII arsenals, including Hiroshima and Nagasaki. At any given moment there are at least 10 of these submarines circling the earth. In the face of this scary topic, John Qua from Global Zero had us imagine what we would do instead with the 30 trillion dollars set to be spent on nuclear weapons over next 30 years. Coming from the millennial generation he explained that most people his age were coming to the peace/anti war movement from other social justice movements and with an understanding of intersectionality. Using the same tactics that were used in the 70s will no longer work as we are now working with a generation of people who have never not known war. The focus on fear and the horror of war is not working as well today as it did in the ‘70s. Today millennials see injustices daily on our social media accounts, and are instead interested in focusing on creating new futures instead of dwelling on the horrors of today. “The White House is not an entity we need to be working with, but something we need to be pressuring. We must stop focusing on the ‘we’re all going to die’ idea of nukes, and instead link arms with all struggles and envision a future we want. There is a connection between gender violence and the nuclear system and war. We are not just challenging Republicans, but we are challenging all parties. We must promote the voices of people most impacted by nuclear violence, such as the nuclear testing that took place on the Marshall Islands just last year. The Marshall Islands filed a lawsuit to the UN, but it was declined. We also continue to mine uranium in indigenous territories in the US. All of these struggles are connected,” Qua stated. Intersectionalism works off of the idea that we cannot fight one form of injustice without fighting all forms of injustice. Thus, it is incredibly important to tie together the ways that racism, sexism, xenophobia and more all tie into the military industrial complex. In 2010, SB1070 started criminalizing immigrants more and in 2011 private prison corporations lobbied powerfully to pass anti-immigrant policies and policies that targeted black communities. In 2010 the prison divestment campaign was launched with 150 groups as part of the multi-racial divestment campaign. There was focus on following the money, and, at the same time as divestment took place, there was intent on what was being built in place of prisons. Garik Ruiz of the BDS National Committee spoke about the need for research about your targets. He outlined how all top US military contractors sold weapons to Israel, which were then used to oppress Palestinian people. Similarly on the US-Mexico border many security towers being constructed on native peoples’ lands to repress the movement of people. Lisa Renstrom from Divest/ Invest spoke about the successes and challenges of the Fossil Fuels divestment campaign. She noted that college campuses really helped get the movement off the ground. Also helpful were media magnets, institution and visible support, working hard on branding, making the movement accessible to investors by narrowing the fossil fuels list down to 200 oil and gas and coal companies. The campaign attempted to avoid making it all too extreme or confusing and focused on being clear and obvious with Fossilfreefunds.org making clear where was good to invest. In the long term it really is in investors’ best interests to invest in renewable energy, and finally, the moral imperative worked well with Al Gore giving the issue national attention through the Inconvenient Truth. The problems of the movement had to do with the fact that most people don’t think of themselves as investors. The campaign had to explain that if you have a 401K you are an investor. In addition, the high money makers seemed to be just beginning to see a moral connection with their money. Finally, people didn’t know what to invest in after they divested from oil and gas. There was a tension between financial and activist culture, and coordination and collaboration was a challenge as well. Another hurdle was dichotomy between divestment and shareholder activism. Divestment is the long term view- South Africa took around 10 years but sent a very powerful message. 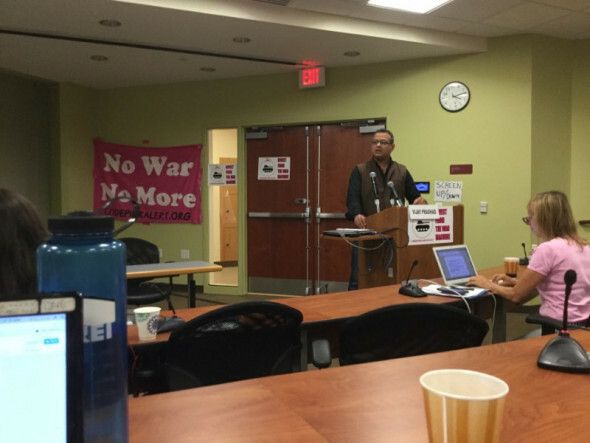 Closing the CODEPINK Divest from the War Machine summit was Vijay Prashad, a historian and journalist. He reiterated that the only way to confront a war economy is to confront a culture of war. “This may be the last presidency of the USA. I’m not sure if this country’s facade of democracy will last for much longer. Also, this president is not an imperialist, but an annihilationist. He is helping to commit capitalist planetary destruction, not just climate change,” Vijay Prashad said. In 2012 there was 1.3 trillion dollars of aid to international community. At same time- developing world sent 3.3 trillion dollars in debt servicing to the US. In essence, the world is subsidizing west while the US gifts the rest of the world with bombs and the destruction of human life and agriculture (bombs and Monsanto). “Americans might ask, why does the world hate us? We’ve done all this for Pakistan, why do they hate us? And then politicians say they hate us for our freedoms. 1 million Iraqis dead, Afghanistan and Pakistan more, why do they hate us? Bush is forgiven for all now that he is criticizing trump and showing up on Ellen. Just because I say my opinion of us is low doesn’t mean I hate you, it means I’m critical. The culture of death has saturated us. Maybe they and the world are scared of the US not because of freedoms in the US, but because US has spent last 60 years taking everyone else’s freedoms. The US is accumulating freedom against everyone,” Prashad stated.